· Soak sabudana in water for 15 minutes and keep it aside. 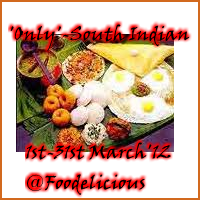 · Take a pan,add 2 tbsp ghee and fry cashews and raisins and remove from ghee, keep it aside. 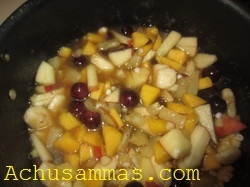 · Add the mixed fruits into the same ghee, sauté for 10-15 minutes. 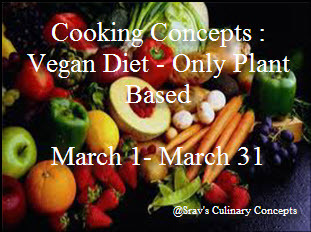 · Add the jaggery syrup and again sauté for 5-10 minutes. Add the soaked sabudana and stirring for 5 minutes. · Finally garnish with fried cashews and raisins. · Serve with warm or cold…. 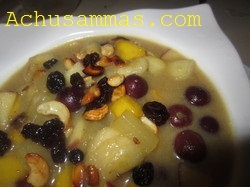 payasam looks wonderful. nice recipe. This would make a perfect light dessert! that's a nice idea dear...wholesome and delicious dessert...looks yummy too!! Fruit, cashews and coconut milk-count me in. Sometimes I really do crave stuff like this-no cake, no pie, just a bowl of sweetened fruit-yum! Great post. 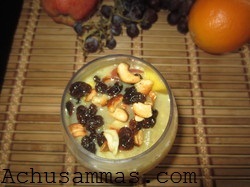 A healthy and tasty payasam, looks very good..
What a delectable sweet way to enjoy fruits! 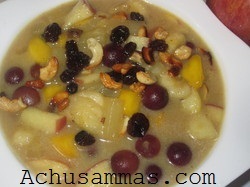 really nice!..........very tasty.fruits,coconut milk..jaggery yummy! This is like panchamrutham. 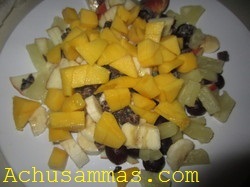 We do it whenever we have some fruits at home - cut them up,add jaggery,nuts, honey. Mix. No cooking. Allow all the juices to come out and seep into the ingredients and it is time to hog! This is a nice variation. simply delicious and wonderful one !! Thanks for linking to the event !! Looks so nice. Thanks for linking.